WASHINGTON — The chairman of the Senate Judiciary Committee is leaving open the possibility of holding a hearing for President Barack Obama’s choice to fill a Supreme Court vacancy, amid signs of uncertainty about how Republicans would treat a nominee to replace the late Antonin Scalia. Sen. Charles Grassley, R-Iowa, said he backs Majority Leader Mitch McConnell’s view that Obama’s successor should make the nomination of a lifetime appointment. 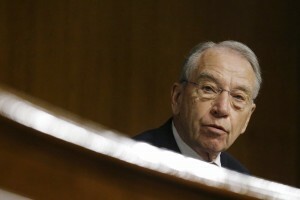 But Grassley didn’t rule out holding confirmation hearings and a vote by his panel on an Obama selection. The battle lines were set almost immediately in the hours after Scalia’s death on Saturday. Senate Republicans, led by McConnell and including vulnerable GOP senators up for re-election this year, said Election Day in November will give voters a say in who replaces Scalia. Senate Democrats countered that Obama is president until Jan. 20, 2017 and has every constitutional right to make the selection and the Senate should do its job and consider the choice. “By ignoring its constitutional mandate, the Senate would sabotage the highest court in the United States and aim a procedural missile at the foundation of our system of checks and balances,” Senate Minority Leader Harry Reid, D-Nev., said in a scathing op-ed in Tuesday’s Washington Post. The No. 3 Democrat in the Senate, Chuck Schumer of New York, said Tuesday that he expects Obama to select a consensus candidate who could get bipartisan support. Sen. Thom Tillis, R-N.C., a member of the Judiciary Committee, cautioned Republicans Tuesday against flatly ruling out any Obama nominee because of the possibility that the president selects someone who matches Scalia’s conservative views. “That’s unlikely to happen, but I think we fall into the trap if we just simply say ‘Sight unseen,’ we fall into the trap of being obstructionist,” Tillis said on “The Tyler Cralle Show” on WAAV in Wilmington, North Carolina. Republican Sens. Rob Portman of Ohio, Ron Johnson of Wisconsin and New Hampshire’s Kelly Ayotte — vulnerable incumbents — echoed McConnell, stressing the decision rests with the next president, especially since whoever is chosen could decide the tilt of the court for generations. Beyond math is the political calculus. Control of the Senate is at stake this election and Democrats looking to unseat Portman and Toomey — along with Ayotte and Johnson — have seized on their call to wait until next year.